Super insulation and airtight construction provide unmatched comfort even in extreme weather conditions. Continuous mechanical ventilation of fresh filtered air provides superb indoor air quality. A comprehensive systems approach to modeling, design, and construction produces extremely resilient buildings. Passive building principles offer the best path to Net Zero and Net Positive buildings by minimizing the load that renewables are required to provide. 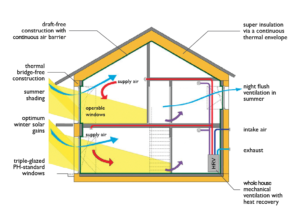 No drafts, No cold spots: the airtightness of our homes makes the house completely draft-free. Since the windows are so good, designed to have interior surfaces that are within 5°F of interior temperature, there are no drafts off the glass like there are in most conventional houses. (That’s why a conventional home has radiators or duct vents under each window, to counteract this). It also means there are no cold spots. Fresh Air, Always: It’s great that the building is sealed so tightly, but people need fresh air. So we always include an active mechanical ventilation system with heat recovery, bringing in filtered fresh air all the time. Of course, you can always open the windows. We encourage our clients to select products that are sustainable, such as Cork Insulation. Cork insulation is a natural, renewable, recyclable, and biodegradable product made from the outer bark of an oak tree. This insulation is made primarily from the extra cork left when making wine bottle corks. Once we’ve superinsulated a home, the windows become the largest source of heat gain and loss. Computer modeling requires us to pick exceptionally efficient Triple Pane windows (often with European style Tilt-Turn hardware). 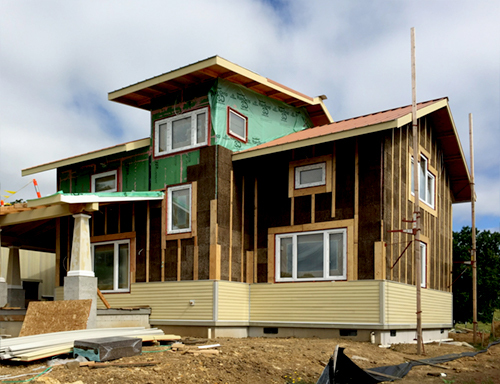 G. Christianson Construction, Inc., is proud to announce that our Owner, Carl Christianson, is the first builder in Corvallis to become a Passive House Certified Builder, joining a small group of elite builders in Oregon and throughout the country. PHIUS is setting the new standard in energy-efficient building. G. Christianson Construction broke ground on our first Passive House project in December 2015. Download a PDF poster to see even more details.